We need to continue scrutinising these organisations to make sure we understand exactly what’s being done with our data. The consequences of widespread portable sequencing, like emerging infectious diseases themselves, will be highly unpredictable. *Liam Shaw, Computational biologist, University of Oxford and Nicola C. Sugden, PhD Researcher, University of Manchester. This article is republished from The Conversation under a Creative Commons license. Read the original blog post. Liam and Nicola’s Geo: Geography and Environment article, ‘Portable sequencing, genomic data, and scale in global emerging infectious disease surveillance’, is available via https://rgs-ibg.onlinelibrary.wiley.com/doi/full/10.1002/geo2.66. All Geo articles are open access. Carmen McLeod is a senior research fellow in Responsible Research and Innovation at the University of Nottingham. Erika Szymanski is a research fellow in Science, Technology, and Innovation Studies at the University of Edinburgh. Joshua Evans is a DPhil candidate in the School of Geography and the Environment at the University of Oxford. Anna Krzywoszynska is a Leverhulme Early Career Fellow in Geography at the University of Sheffield. Alexandra Sexton is a research fellow in the School of Geography and the Environment at the University of Oxford. I guess I’m not alone in either struggling with GIS (Geographic Information System) technologies, or seeing colleagues struggle to effectively use it. When the GIS does not work, or when learning resources use jargon that the would-be GIS users do not understand, they tend to blame themselves. This should not be the case – though never intentional, badly designed systems, materials or practices should be held accountable and either improved or completely rethought. These problems exist, regardless of discipline, when using GIS. My professional experience includes working in private, public and academic sectors, across a variety of industries, and I have seen this same issue continually arise – enthusiasm turning to frustration when people cannot do what they want to do with the GIS, so they abandon the technology. As GIS professionals, I believe we have a duty to do better and promote the overall understanding of GIS and associated materials, to improve the likelihood of success and uptake. It is my hope that through my research, we can learn how to better support an increasingly diverse range of GIS users, foster that enthusiasm for GIS and create a better and more inclusive community of practice with and around GIS. My recently published article, titled “A suggested framework and guidelines for learning GIS in interdisciplinary research”, is based upon my PhD research and has been written with co-authorship and support from my supervisors, Claire Ellul and Muki Haklay. In the article, I share elements of my PhD work which focused on how people go about learning to use GIS, particularly in the context of interdisciplinary research. From this work, I make recommendations on how these results can be used, going forward, to improve the process of learning GIS for future learners. To begin, I had to first understand what interdisciplinary researchers were doing with GIS and the issues they faced that might affect uptake. These preliminary findings were discussed in Rickles & Ellul (2015), which identified challenges and suggested solutions in interdisciplinary research, as well as a theoretical understanding of learning approaches. Based on an evaluation of prominent interdisciplinary studies using GIS, and observations of an interdisciplinary team’s use of GIS, the relevance of those challenges and suggested solutions were reviewed to support a learning approach. The knowledge gap and time constraints were the most common challenges, with building relationships and training often suggested as solutions. Problem Based Learning (PBL) – where learners restructure their knowledge to solve real world problems as part of a collaborative process with other learners and/or educators – was put forward as a viable approach for learning GIS in interdisciplinary research. This article provides updates to and further enriches that initial research. An online survey of interdisciplinary researchers provided verification of the issues uncovered in the first article, with interviews providing a more in-depth exploration of what those issues may mean in a practical sense. An overview of those findings shows that interdisciplinary researchers are using GIS to create, analyse and visualise information; that they are using ArcGIS and QGIS desktop platforms as well as web GIS platforms such as Google Maps/Earth and ArcGIS Online; and that they are using informal learning methods (e.g. internet searches, watching a video, asking a more experienced person). The findings also suggest a more structured learning approach may be supportive of the learner, but PBL can be time consuming for both the learner and educator. Therefore, Context Based Learning (CBL), which recognises the importance of the context of the problem domain for the learning activity, but allows for materials to be created in advance, may be a more appropriate approach. Combining these elements, which modify the Technological, Pedagogical and Content Knowledge (TPACK) framework, guidelines and a specific framework are suggested for educators to use to support interdisciplinary researchers learning GIS. My further research has applied these in a practical setting using a learning resource titled “GIS Lessons for You” (www.patrickrickles.com/tutorial), to test the guidelines and framework. The results will be published as part of my PhD and potentially as a future article. Patrick Rickles is a PhD student in the Department of Civil, Environmental and Geomatic Engineering at University College London, and is also an Implementation Analyst for the Department of Communities and Local Government. Aquatic ecosystems have become increasingly vulnerable in recent years due to interactions between climate change and human activity such as nutrient enrichment, microplastic and organic pollution, extraction, salinization, and catchment modifications. Long-term ecosystem research and monitoring (LTERM) are crucial in the debate of timing, extent, and causes of human-related impacts on aquatic ecosystems, and are key to understanding the complex nature of ecological responses to stressors and related transitions within aquatic ecosystems. Key LTERM approaches include monitoring and modelling, palaeolimnology, and analysis of historical and documentary records. Moreover, investigations involving multiple components of the biological and geochemical records of aquatic systems can help disentangle the impacts of multiple stressors on an ecosystem, develop an understanding of synchronous ecological impacts within ecosystems, allow for an understanding of the sensitivity of ecosystems to anthropogenic impacts, and may result in the development of more robust palaeoenvironmental reconstructions. The collection of papers will explore multidisciplinary approaches in determining the timing, extent, and nature of ecological responses to recent anthropogenic stressors within aquatic ecosystems. We encourage papers that explore the relationship between various biotic and abiotic components of inland freshwater and/or coastal brackish ecosystems in response to external forcing. We especially welcome investigations across a variety of temporal and spatial scales, and which explore the use of multiple indicators in multi-stressor systems. Geo: Geography and the Environment has an international and interdisciplinary reach, making it ideally placed to facilitate the results of palaeolimnological studies which have implications for further study and international aquatic resource policies. Geo publishes articles gold open access only, making an author’s work immediately and fully accessible to publics, stakeholders, policy-makers and other academics internationally. The journal is funded by article processing charges (APCs). Information on this can be found here. Geo is keen to encourage as many working within the geographical and environmental sciences to make use of the grants (see institutional funding policies here) and waivers (for information see here) that have been distributed to institutions to fund authors to make their work open access. A small number of waivers are available for authors who are not otherwise able to access funding for APCs; APC waivers will be considered on a case-by-case basis. The editors do not have any involvement in the APC process for individual papers to keep editorial decisions separate, so specific queries about APCs will be forwarded on to the managing editor at the RGS-IBG, Fiona Nash. Framed as an interdisciplinary endeavour, it is probably no surprise that authors come from various disciplinary backgrounds, including physical and cultural geography, art history and media studies, history of science and environmental history. 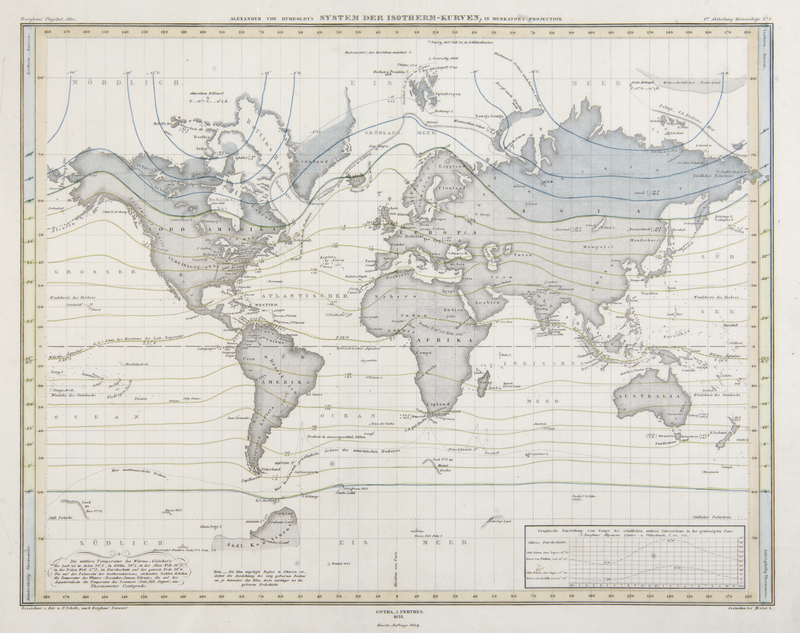 Thus, the subjects, periods and geographical regions covered vary greatly. In several essays, the nineteenth century plays a pivotal role, mainly because Humboldtian science introduced to the Earth sciences a uniquely holistic approach, the analysis of which is central to many contributions. For instance, geographer Regnauld and art historian Limido identify Humboldt’s work as the first serious investigation into the concept of a global ocean. 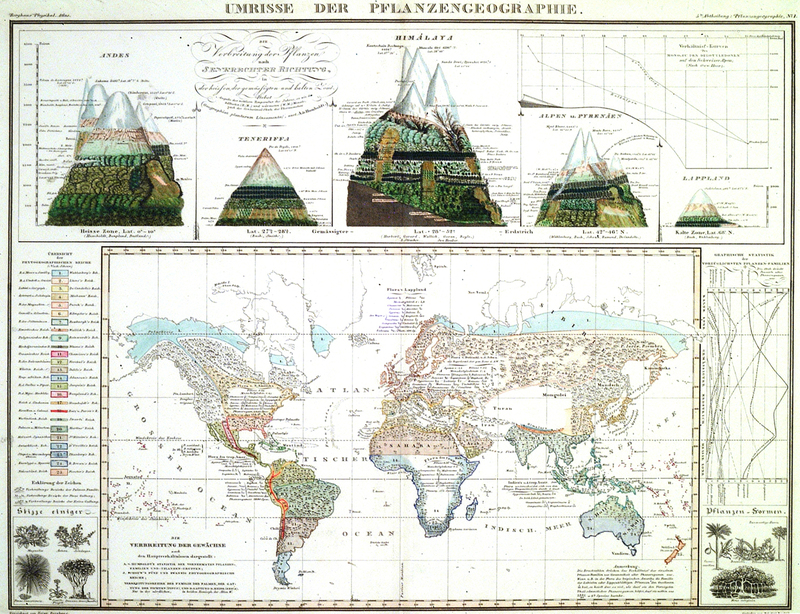 And in a similar vein, both Sebastian Grevsmühl and Birgit Schneider read Humboldt’s innovative cartographic contributions to the Earth sciences as an important founding moment of modern climatology. In all three case studies, the visual is identified as playing a significant role in emerging notions of “whole earth” thinking. This development intensified of course during the second half of the twentieth century, and most contributions therefore discuss the historically diverse paths taken by these movements towards global and holistic views of the environment. All of the essays insist in one way or another on the complex relationships that exist between the ‘local’ and the ‘global,’ and argue that global environmental views have become a dominant, almost hegemonic trait within the climate sciences and physical geography. Unsurprisingly, climate change and its consequences feature as a major topic of this special issue, with one aspect in particular deserving more scholarly attention: the politics of the visual. Indeed, one main aim of the special issue was to invite contributions exploring various ways in which images can become political agents. Grevsmühl, for instance, suggests future work might identify and chart out the political spaces of global environmental images: the changing perceptions of the various physical sites from which they emanate, or through analysing the actual technologies involved in creating global environmental knowledge. This may eventually lead to important new questions about who has access to the infrastructures that produce global environmental knowledge, who may speak on behalf of the global environment, or who has the right to control the future – all questions that are picked up by several contributions to this special issue. As each global environmental image participates in its own way in a certain mode of storytelling, the framing, the cultural forms mobilised, as well as the mediating technologies involved all play a major role in shaping our ways of knowing, highlighting for instance certain themes and topics whilst obscuring others. This is particularly true for the El Niño case discussed by historian of science Sabine Höhler, who convincingly argues that the nowadays omnipresent satellite framing introduced ideas of controllability and predictability, to the detriment of an ancient oral tradition which insisted rather on the local violence produced by extreme weather events. Other important political effects of the visual can be observed in climate change photography as human geographer Martin Mahony shows, where typification processes can lead to a “simplistic, racialised politics of place,” calling thus for a re-politisation of global environmental images. As an interdisciplinary inquiry, all contributions to the special issue celebrate a methodological openness which may prove crucial in order to engage in a dialogue cutting across disciplinary boundaries, conceptual frameworks and institutional borders. We invite the reader to explore with open-mindedness some new methodological tools which enable us to engage in a historically informed, critical analysis of global environmental issues. By Sebastian Grevsmühl (special issue guest editor) and Martin Mahony (Geo blog editor). Grevsmühl, S. V. (2017) Visualising the global environmental: new research directions. Geo: Geography and Environment, 4:1, e00035, doi: 10.1002/geo2.35. Schneider, B. (2016) Burning worlds of cartography: a critical approach to climate cosmograms of the Anthropocene. Geo: Geography and Environment, 3:2, e00027, doi: 10.1002/geo2.27. Höhler, S. (2017) Local disruption or global condition? El Niño as weather and as climate phenomenon. Geo: Geography and Environment, 4:1, e00034, doi: 10.1002/geo2.34. Regnauld, H., and Limido, P. (2016) Coastal landscape as part of a global ocean: two shifts. Geo: Geography and Environment, 3:2, e00029, doi: 10.1002/geo2.29. Grevsmühl, S. V. (2016) Images, imagination and the global environment: towards an interdisciplinary research agenda on global environmental images. Geo: Geography and Environment, 3:2, e00020, doi: 10.1002/geo2.20. Mahony, M. (2016) Picturing the future-conditional: montage and the global geographies of climate change. Geo: Geography and Environment, 3:2, e00019, doi: 10.1002/geo2.19. Microbial communities are fundamental components of every ecosystem and every species on the planet. Although recent advances have been made in understanding their interactions with human, animal and environmental well-being, many of the specific geographies and functional roles of microbial life remain uncertain. Answering these questions requires new forms of enquiry which reach across the domains of life, spaces, and disciplinary perspectives. We are seeking high-quality contributions (original scientific papers, reviews, perspectives and data papers) about the geographies of the microbiome. Papers would bring the different sub-disciplines of geography into dialogue in seeking to make sense of these patterns and processes. We are interested in the range of interdisciplinary and collaborative approaches (e.g. human / physical / biological / citizen science practices) which are helping to further our understanding of the connections between microbial communities and spatial processes at different scales. We encourage submissions which discuss the methodological challenges of mapping microbiomes and managing microbial data, including engaging with the complexities of taxonomies and metagenomics. We also welcome studies which focus on managing microbes, as well as recent perspectives on both antimicrobial resistance (e.g. practices of spread, containment, evolution) and the recognition of microbes with respect to questions around more-than-human geographies. We are interested in contributions that explore the social dimensions and political ecologies of microbiome science and its translation. Geo: Geography and the Environment has an international and interdisciplinary reach, making it ideally placed to facilitate exchange on emerging work on the microbiome across the spectrum of geographical and environmental research. This RGS-IBG and Wiley journal publishes open-access articles, funded through Article Processing Charges (APCs). These are normally available through your Higher Education Institution; you can check your eligibility by submitting your institution and funder here. There are also a series of discounts and waivers available from Wiley. Further full-fee waivers will be considered for high-quality submissions for this special issue on a case-to-case basis, where authors are unable to access other institutional funds for APCs. Please contact journals@rgs.org for queries relating to APCs. To ensure that editorial decisions are never influenced by ability to pay, the editors are not involved in correspondence with authors regarding payment of APCs.